Dear me, Dear Delicious is good. 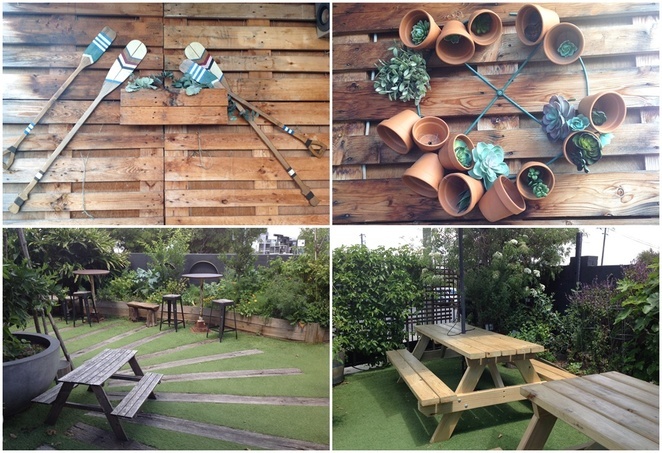 This wonderful cafe in Dulwich Hill is a treat with its urban garden and wholesome food where your classic breakfast and lunch dishes come with an innovative twist in flavours and colour. A recent renovation has also added a splash of colour to this bustling corner spot opposite the station. Arriving at noon on a beautiful sunny day, we were happy to be led outside to the garden area to enjoy our lunch and the fresh air. Here some interesting decor abounds that provides a rustic and relaxing country vibe. Wooden pales on walls, painted oars, an arrangement of pot plants, a teepee-style structure, bench tables and seats that you'd find in a park, and a herb and flower garden are all part of the picture. At the same time, there's some modernity with a lounge area and comfy cushions, outdoor bar, high tables and stools you'd find in a pub. We ordered our drinks first, some refreshing cold pressed juices – a Pineapple Peace with pineapple, apple, lemon and mint; and a Something (yes, that was the name of it) with orange juice, watermelon, lemon, pear, apple, ginger and mint. Both were dearly delicious. A range of other healthy combinations are available in their 'him & hers' organic herbal infusions and raw blends, along with milkshakes, Kombucha and beer on tap, wines, fine teas, coffees and cocktails. The iced hazelnut and macadamia latte sounds good. I think I'll have to venture back for that one. From the main menu, we chose some colourful items. My cafe buddy went with the Dearest Fishy Tortillas. Coming with beautifully-cooked and decent-sized pieces of fish in each of the three tacos was an array of appealing accompaniments in wattleseed kraut, picante mayo, avocado, corn, black beans, kumara (sweet potato) crisps and paprika salt. All went down well and got a tick of approval. I decided to go with the Dear Delicious Steak Sandwich. I don't eat steak a lot but the Cape Grim scotch fillet sounded good with its caramelised onion, beetroot, cultured pink slaw, rocket and horseradish aioli. There were some sweet flavours in there to my liking and together with the thinner juicy steak slice and crunchy sourdough bread, it went down a treat. It certainly was satisfying and gets a 'thumbs up' from me. Other savoury items include an open brekky burrito, an avocado 'heaven on earth' with charcoal quinoa bread, acai goodness, cheesy eggs, turmeric chickpea fritters, burgers and salads. You can add to your feast with the likes of goat cheese, trout, bacon and extra eggs. Sweetness comes in lemon curd brownie sandwiches and slices of Bounty, Berry Ripe, Trix and White Chocolate from the coffee counter inside. From the menu, there's the Love Summer Pancakes that we shared. Some fresh citrus flavours in mandarin and limoncello curd, as well as rhubarb pieces and rosemary vanilla ice cream, accompanied the usual berry salad. That curd was fantastic and the rhubarb (I love it) reminded me of my mother's cooking. Adorned, with pansies, the dish was well presented and a lovely ending to our experience at Dear Delicious. Pricing is favourable in the current spring menu, with all items under $20. Owners Greg and James Vikiarellais use seasonal produce from their garden to bring healthy creations through the kitchen to the table, keeping prices down at the same time. Quick and cordial service was had in this spacious cafe that provides handmade touches to every dish, whilst catering to different dietary needs. They're a sustainable bunch too in using bio-degradable takeaway containers, eco-friendly cleaning chemicals and composting 30% of waste that is turned into the garden. Dear Delicious is open 7 days a week (times below), including for dinner on Thursdays and Fridays with pizza on offer. They also cater for children's parties, cocktail events, weddings and Christmas functions with food and beverage packages available to suit a variety of budgets. For something unique, add to your event with their Bonny Retro Gelato Cart. 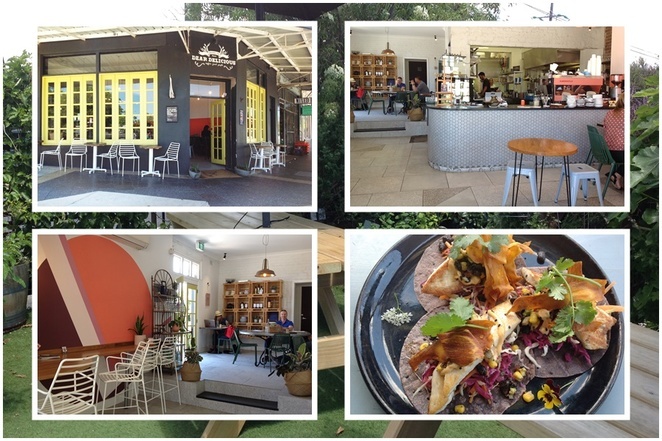 So drop by for a nourishing adventure of the palate and say hello to health and happiness. Oh my gosh, I love rhubarb too, Irenke, fabulous spot you've found there - the food looks dearly, divinely, delicious!